As part of our series on project leadership training, Susanne Madsen, Leadership Coach, discusses the art of influencing people. She defines four different personality types to help you determine which type you are, as well as strategies for influencing people on your team. The Driver—a results-oriented person that is usually outgoing and assertive. Often your executive is a Driver. The Expressive—enjoys social interactions, talking and communicating in person or on the phone. The Amiable—empathetic and looking to achieve social harmony. The Analytical—a detailed thinker, focused on compliance and doing things right. As the above whiteboard shows, some of these types tend towards being detail thinkers, while other are more into the big picture, some are reserved and slower paced, while others are outgoing and assertive. Each type brings a value to your team, and knowing how to communicate with them makes you a better leader. It also helps you understand what type you are. Knowing your own type is key to communicating with others, as well. Pro-Tip: While knowing what kind of personalities make up your team, it is also important that you know what your team expects from you. Hi I’m Susanne Madsen. 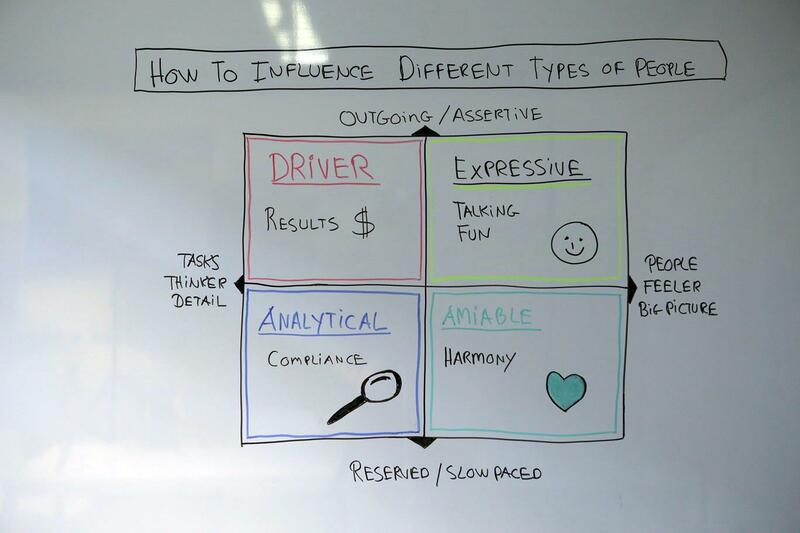 Welcome to this white board session on ‘How To Influence Different Types Of People’. In order to look at the different types of people we have, I have drawn up a matrix and we’re going to go through four different types of people. We’re all a mix of all of them. But let’s see if you can spot which one is most descriptive of yourself. On your left hand side, you will see that we have someone who is task oriented, detail oriented and a thinker. And on your right hand side, we have someone who is much more people oriented, big picture and the feeler. Towards the bottom of the screen we have someone who is more reserved and slow paced and at the top we have the opposite, someone who is outgoing and assertive and much more fast paced. That gives us these four basic types. Let’s start with a red, with the driver. The driver is detail oriented but impatient in an organization, they’re typically your CEO types. They like results and the way to influence them is by getting to the point quickly. They like the detail but they don’t have time for the detail which is a bit of a dichotomy. So give them executive summary and bullets and let them drive the rest, let them ask into the detail, tell them that you have it and you must absolutely also have it with you. Never say you have it without having the detail there. Now moving to the yellow personality type, these are expressives. They’re outgoing, fast but they’re people oriented, they’re feelers. In an organization, they are typically your sales people and your marketing people. They like fun. So how to influence them? Well don’t send them long detailed e-mails because they may never check their email and certainly not read it if it’s a long one. What they would appreciate is that you drop by their desk or you give them a quick phone call and when you speak to them make it a bit more fun and outgoing. Make them talk, they like to talk. Ask them how they’re doing, how their weekend was. So make it a little bit more lighthearted before you get down to business. Now let’s move down and look at the green personally to type. These are amiables. Amiables are more reserved and slow paced but they’re still feelers. These people don’t like too much change. They’re really all about harmony. They’re great listeners, great team players and in an organization, they’re typically your HR professionals or caring professionals. The way to influence them is to sit down have a one on one conversation and ask them how they’re feeling and give them time to consider their responses. They do not appreciate being put on the spot. Remember harmony is very important to them. Now these people down here don’t do quick estimates. They like to do things thoroughly and properly and that takes time. So such a message is going to frustrate them quite a lot. So my question to you now is which personality type are you? Are you predominantly red, yellow, green or blue? That’s important because you will tend to communicate from your own preference.